Wikipedia’s Mate definition: Mate is a traditional South American infused drink. It is prepared from steeping dried leaves of yerba mate in hot water. It is the national drink in Argentina, though Paraguay and Uruguay also happen to claim nationality over the beverage, and drinking it is a common social practice. The drink contains caffeine. Mate is served with a metal straw from a shared hollow calabash gourd. The straw is called a bombilla in Latin American Spanish. The straw is traditionally made of silver. Modern commercially available straws are typically made of nickel silver, called Alpaca, stainless steel, or hollow-stemmed cane. The gourd is known as a mate or a guampa. Even if the water comes in a very modern thermos, the infusion is traditionally drunk from mates or cuias. However, “tea-bag” type infusions of mate (mate cocido) have been on the market in Argentina for many years. As with other brewed herbs, yerba mate leaves are dried, chopped, and ground into a powdery mixture called yerba. The bombilla acts as both a straw and a sieve. The submerged end is flared, with small holes or slots that allow the brewed liquid in, but block the chunky matter that makes up much of the mixture. A modern bombilla design uses a straight tube with holes, or spring sleeve to act as a sieve. 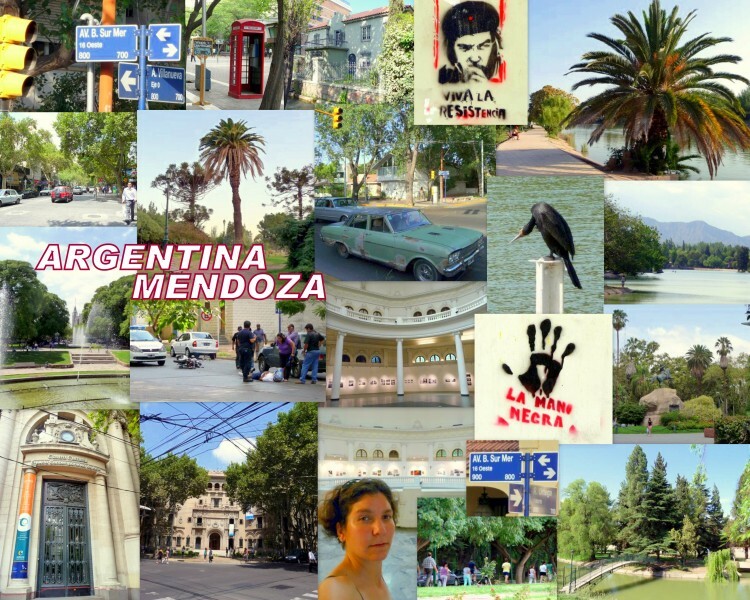 Argentina is definitely a country where I want to come back! I still need to visit the North and the famous South with the glacier and Ushuaia. I don’t know exactly why I so much enjoyed it… Maybe because it looks a bit like Europe – with European’s cars, Carrefour shops, clean streets… – and I was happy to find this atmosphere again after 4 months of travel in countries far different than what I new. And definitely because of the friendly Argentine I met! From Alejandra to Maxi, without forgetting Pablo and lovely couple Eze & Flor, as well as most other people I get to talk to. 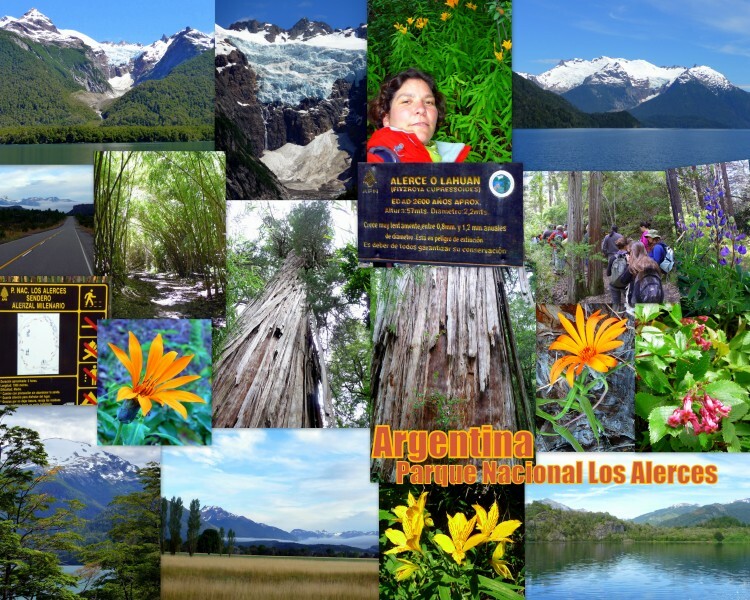 Argentina is definitely a country where I could live for a while… – Ok, only in region under 25 degrees! West of Esquel, the spacious Parque Nacional Los Alerces is home to creeks, verdant mountains and mirror lakes. However, the real attraction is the alerce tree (Fitzroya cupressoides), one of the longest-living species on the planet, with specimens that have survived up to 4000 years! As I was a bit lazy to hike, I went on a long! boat trip, including a 2 hours hike – well, 2 hours including the many stops of our flock… – to discover this famous tree. If I had to do it again, I think I’ll take only half of the trip as sitting for more than 5 hours wasn’t that fun finally… Still landscape was amasing as usual! Next day I came back to have a small hike on my own as after paying nearly 4 times more than local people I just wanted to make the most of it, even if transportation there isn’t really easy! 1 hour bus ride only twice a day: 7:30am and 2:30pm… On my way there I had a really nice chat with the young Karina going to help her Dad at the restaurant. 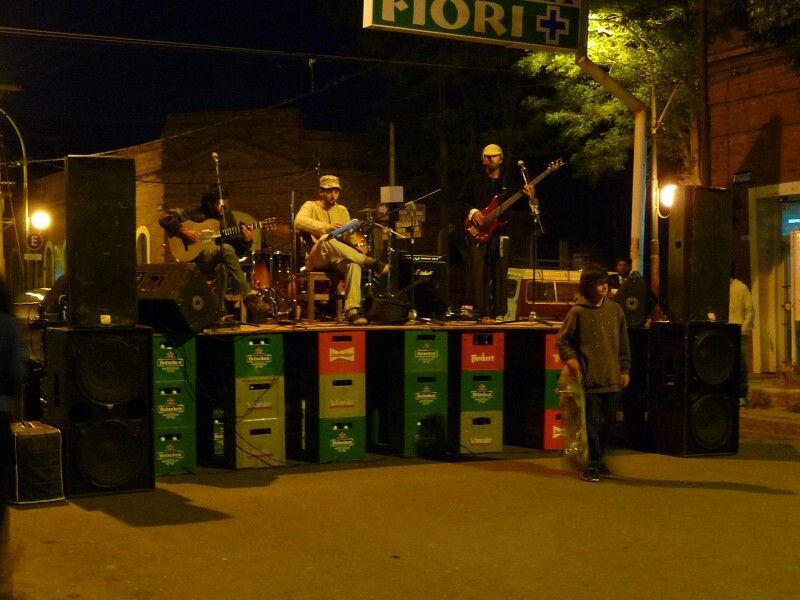 When I came back to Esquel, I come across a funny street concert with a stage made of beer basket! 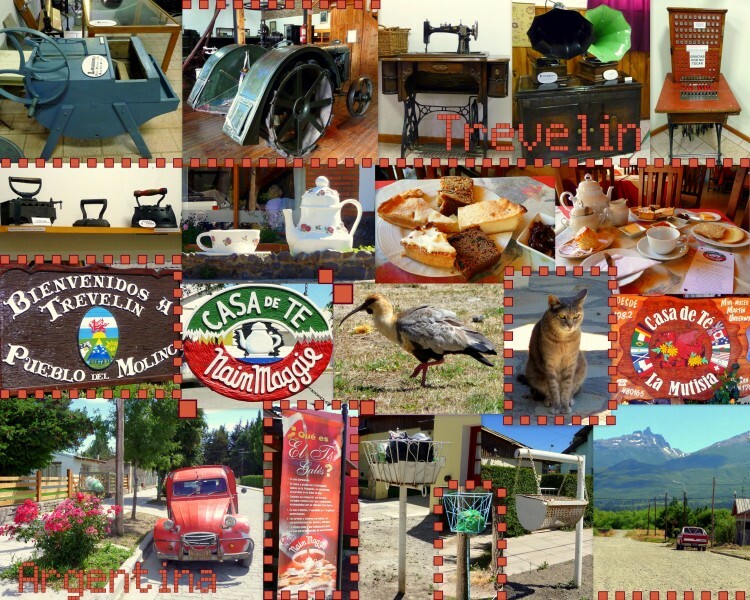 Trevelin – El Té Galés! On Maxi advice - again! and thank you so much, again!!! 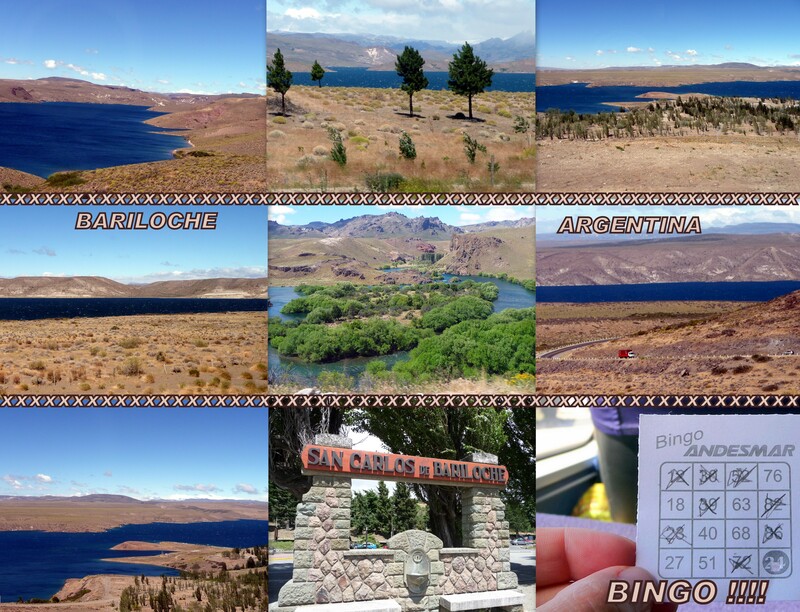 – I went to Trevelin, a small village 25km away from Esquel. This is the only community in interior Chubut with a notable Welsh character from where does come from the name: tre – from the Welsh for town and mill (velin) = Trevelin. There is not much to do there but they do have a small Museo Regional – Mum you would have love it! – giving you a hint about the Welsh history and culture in the Andes Mountains range with old dailylife stuffs, going from glasses to clothes, flatiron ; from wringer to tractors… Most of them coming from Europe as from the Welsh community. Of course, I couldn’t miss the Té Galés: the famous tea ceremony accompanied by a variety of cakes and tarts: sweet toffee cake, cream tart, raspberry tart, scones, and the traditional welsh black cake… I definitely need to change my garde-robe now!!! I went to one of the oldest tea house: http://www.casadetenainmaggie.com – Believe me or not but I didn’t eat in the evening… Ok just a little peace of bread to say I wasn’t going with an empty belly to bed, ! What a day: Sunday in a Swiss Colony in Argentina… Colonia Suissa was the first Swiss settlement in Patagonia. 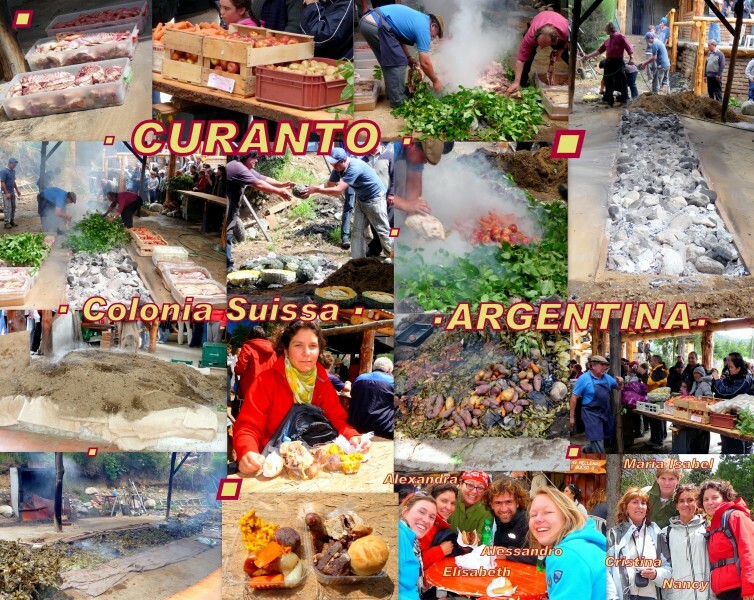 On Wednesday & Sunday there is an arts & crafts fair and restaurants prepare a traditional mapuche food called Curanto, in which they cook the food using a hole in the earth filled with hot rocks. I couldn’t miss that! 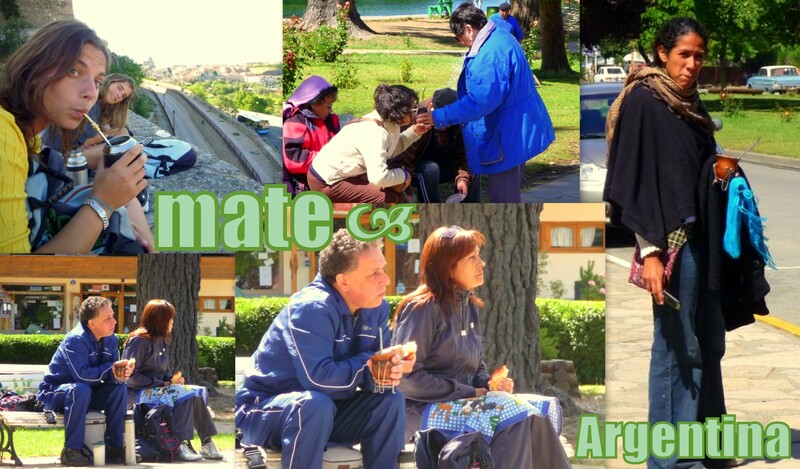 While waiting for the bus I had a chat with 3 Argentine womans – Cristina, Nancy and Maria Isabel – going there too. The cue was so long that they called another bus to bring everybody there. nalca or maqui leaves, and add various vegetables and even fruits such as: carrots, onion, apple, pumpkin, of course potatoes… with different types of meat and and recover all that with ash to cook it for about 2 hours. It gives such a good taste to the food! It remind me of the great dish we had in Poland few years ago, cooked by Monika’s parents to make us discover a tradional food from her region! Monika, will you give me the name again?! 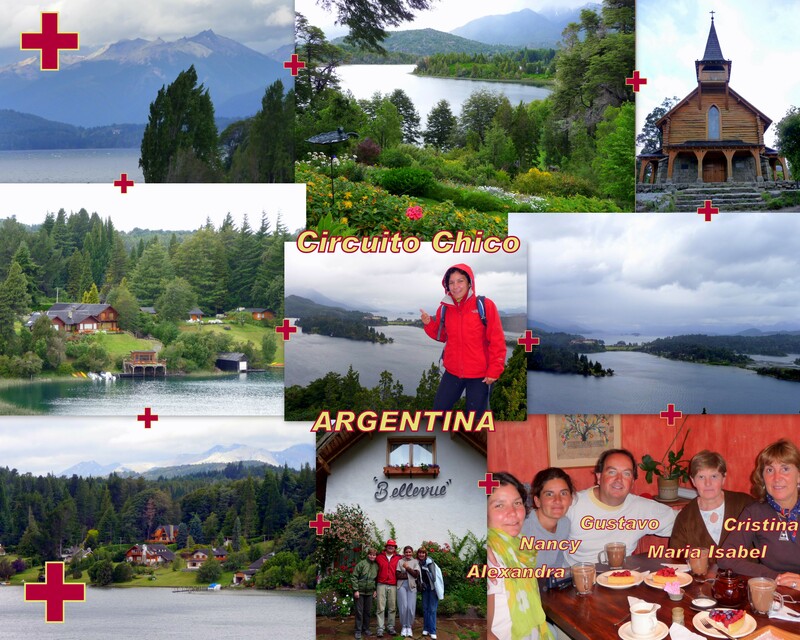 While I was thinking to go back to Bariloche I came accross Cristina, Nancy and her Mum Maria Isabel with Gustavo. They offer me to join them and Gustavo – guide in the region! 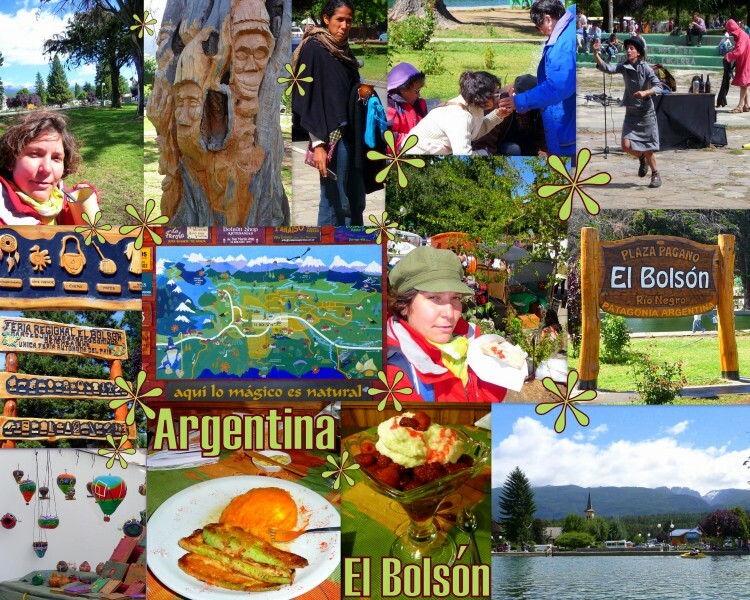 – drove us around the famous Circuito Chico to see the outskirts and the characteristic sites of the city with a nice break at the lovely tea-cofee shop Bellevue for a small dessert… Thank you so much for this time shared together! It was terrific! 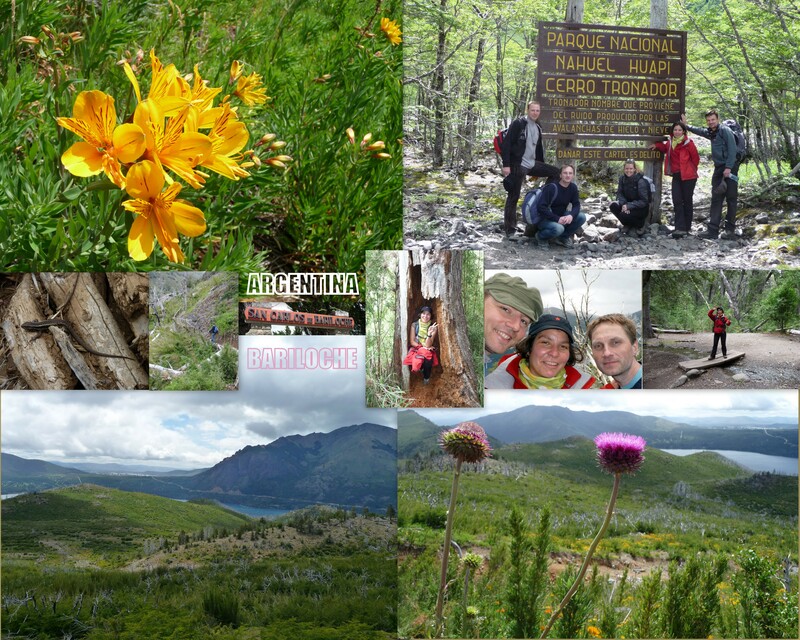 When arriving in my dormitorio I met 2 friendly German guy: Frank & Christoph with whom I spent the next 2 days, hiking around Bariloche – where I encounter another wooden bridge… Ariane, Gregoire does it remain you something? On the next day German multiply by 2 – I was glad to hear German again but I have to say that it was pretty hard to speak… Mixing Spanish and German… – Florian & Viviane (she is from Aachen! 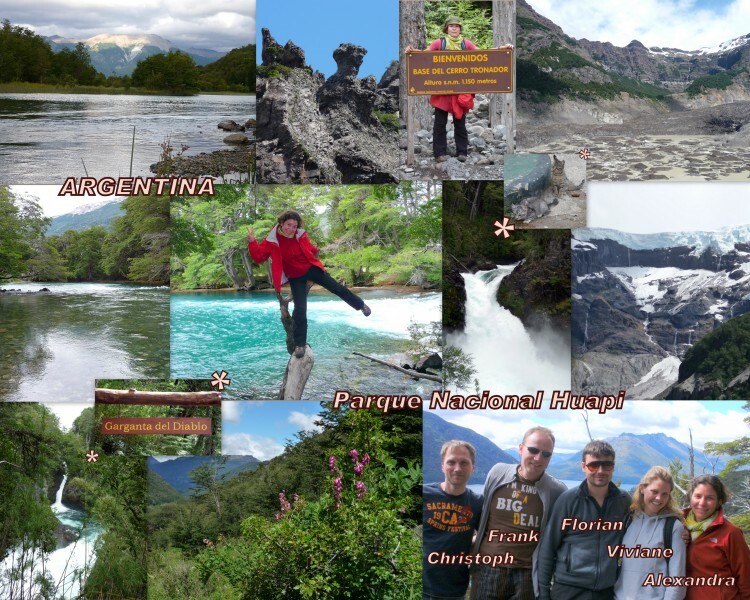 join us and we rented a car to go to visit el Parque Nacional Nahuel Huapi and see waterfalls and the strange black glacier! 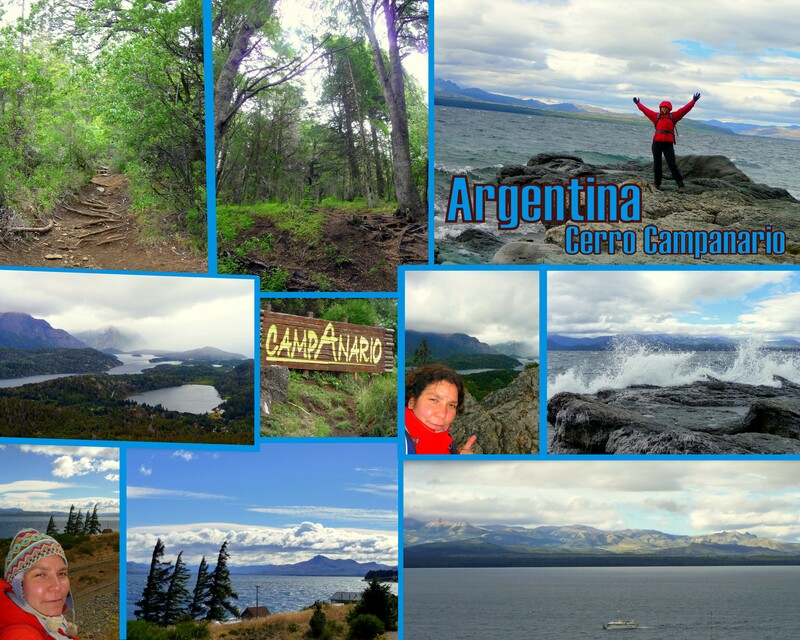 Travel to Bariloche was amazing! Just after leaving Mendoza there were thunderstorm all around and during more than 3 hours we could see lightning far away, kind of thing you see in movies, wondering if this can be real… Yes, this can be real and it was absolutely amazing!!! Its pretty hard to describe and of course pictures waren’t possible, however this was spectacular to be sitting confortably and beeing just in front of the show! Following my 15 hours bus trip in a confortable Andesmar bus where they even offer you to play bingo! – Ok I didn’t win but it was fun! 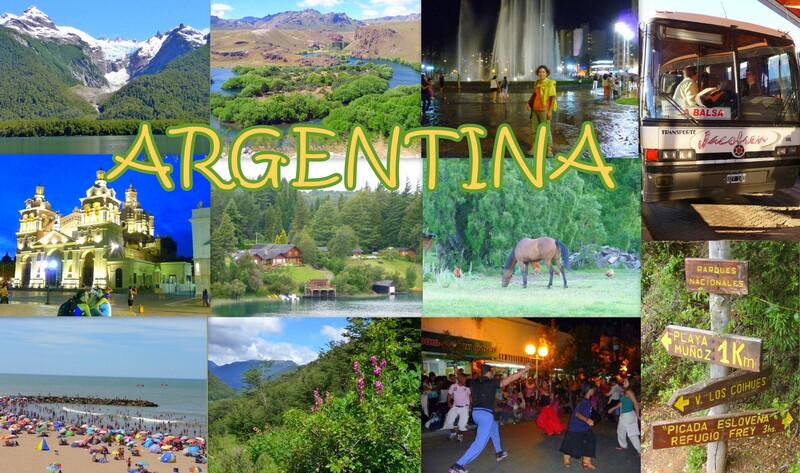 – I finally arrived to Bariloche!!! What a relief! I’ve lost more than 20 degrees but I could breathe again! And the view from the Hostel Inn – C/ Salta 308 www.hostel-inn.com – is awesome: lake who seems to be a sea and mountains all around… Thank you so much Maxi to convince me to come here rather than going to the north!